The recession of glaciers globally in response to climate warming has led to a dramatic increase in the size and number of moraine-dammed supraglacial and proglacial lake systems (Loriaux and Casassa, 2013) (see Figure 1). High-magnitude outburst floods from moraine- impounded glacial lakes represent a highly-complex, multi-stage catastrophic phenomenon, capable of accomplishing significant geomorphological reworking of channel- and valley-floor floodplain environments and posing a very real threat to infrastructure and the safety and livelihoods of communities. In Peru alone, outburst floods from glacial sources caused ~32,000 deaths in the 20th century, as well as destroying vital economic infrastructure, settlements and valuable arable land (Reynolds, 1992; Richardson and Reynolds, 2000a). In the Nepal Himalaya, it has been estimated that the costs associated with the destruction of a mature single hydropower installation by an outburst flood could exceed USD 500 million (Richardson and Reynolds, 2000a). Globally, Glacial Lake Outburst Floods (GLOFs) pose a threat to livelihood and development in many developing countries throughout South America, the Himalayas, and other parts of Central Asia. 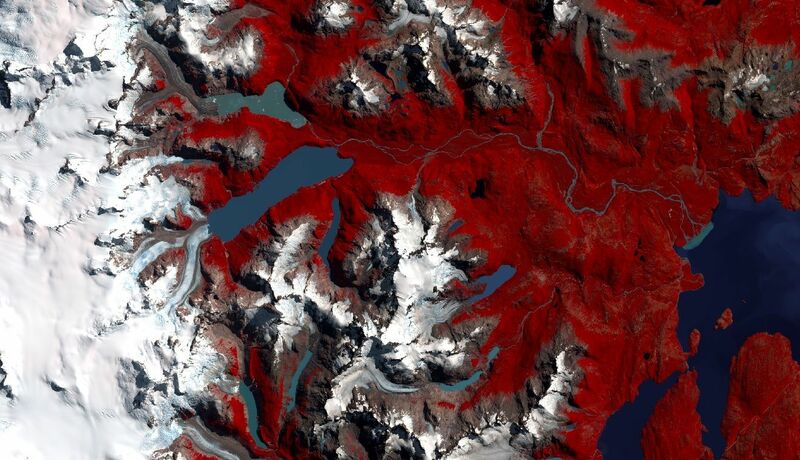 Figure 1: False colour composite Landsat 8 satellite image (acquired in March 2016) of a section of the Northern Patagonia Icefield, Chile, showing the existence of several large proglacial moraine-dammed lakes. Our understanding of the conditioning factors required for lake development and expansion has advanced considerably in recent decades. This can be largely attributed to advances in the capabilities of space-borne sensor technology (i.e. satellite remote sensing) and Geographic Information Systems (GIS) (Quincey et al., 2005, 2007; Bolch et al., 2008). Westoby et al (2014) recently reviewed the processes affecting floods from moraine- dammed glacial lakes and noted that Glacial Lake Outburst Floods (GLOFs) are extremely complex phenomena. Each is a distinctly unique event, the characteristics of which are determined by, among other things, the triggering mechanism(s), reservoir hypsometry, the geometry, composition and structural integrity of the moraine dam, as well as the topography and geology of the flood path. Westoby et al (2015) also demonstrated how numerical GLOF simulations can be used within a probabilistic framework to make estimates of the potential future impact of GLOFs at those sites where moraine-dammed lakes are currently developing. Most of these studies originate from high-mountain areas such as the Himalaya because here glacier recession has created a topographic setting where moraine-dammed lakes can form. However, there are still large knowledge gaps including how and why these moraine-dammed lakes form and evolve through time, and the controls on their demise. Less still is known about the GLOF hazard in other mountain regions such as the Andes of Chile, even though former GLOFs have been identified here (Harrison et al., 2006; Iribarren et al., 2014; 2015). Mountain glaciers are rapidly receding in Chile and infrastructure development and tourism have increased significantly in recent years. The main research priority now is to develop relevant protocols and methods by which to identify potential GLOF sites in Chile, monitor their evolution through time and to assess their hazard potential.